The Formaggio is another original gourmet cheese board and tools set. 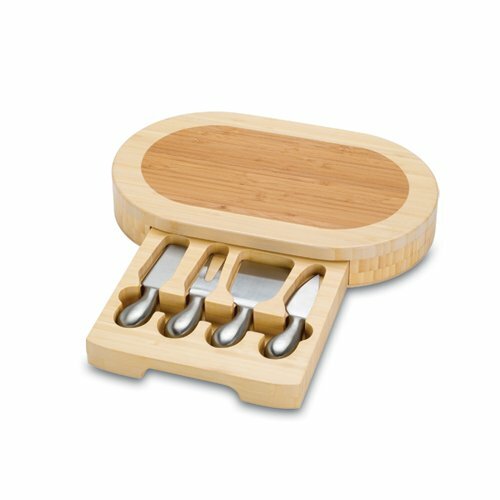 It features a wooden two-toned oval cutting board with slide-out drawer to hold four-piece stainless steel cheese tools. Made of eco-friendly bamboo, one of the fastest growing trees in the world, the Formaggio measures 7.9in x 8.7in x 2in. A drawer at the base of the board pulls out to reveal four ergonomic, hollow-handled stainless steel cheese tools, including: 1 blunt-nosed soft cheese knife, 1 chisel knife (for hard, crumbly cheeses), 1 cheese fork, and 1 hard cheese knife/spreader. With its classic style and beauty, the Formaggio will impress your guests when you present it at your next party.